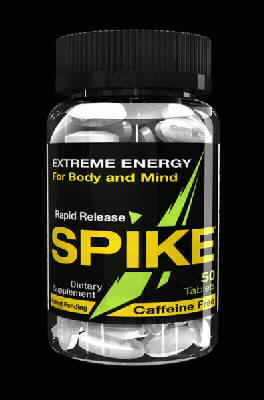 Spike Caffeine Free - All The Focus without losing the edge! Due to the incredible popularity of Biotest Spike we have at last got our mitts on Biotest Spike CF (Caffeine Free). Well, Spike it's self is a cracking product for focus and intensity (mental and physical) but caffeine can have unwanted side effects. When facing typical situations of adrenal rush/dump a high dose of caffeine may not be one of the best things in the world to take, so with this in mind, Biotest have produced Biotest Spike Caffeine Free. In it's own right, a great product, but even better by now being available in pots of 50 tablets. For the ultimate buzz then there's no substitute to the original Spike tablets, but for a buzz free, jitter free option this is the one to go for. Other Ingredients: lauroyl macrogol-32 glycerides, gelatin, FD&C yellow #5, FD&C yellow #6, titanium dioxide.